A bachelor’s degree in psychology/business and a master’s degree in social work from the University of Texas at Austin places Sabina in a unique position in her career at Q2 Software Inc. She strongly believes that IT and banking are essential sectors for the development of any community. Sabina made a conscious decision to serve the community via this unique combination. Sabina joined Q2 as a project coordinator in April 2012, and currently works in the marketing department. She is part of an end-user marketing team responsible for creating campaigns and ideas to help banks and credit unions promote their products. “There is a widespread misconception that local banks and credit unions do not offer the same convenience and technology as the national banks,” said Sabina. 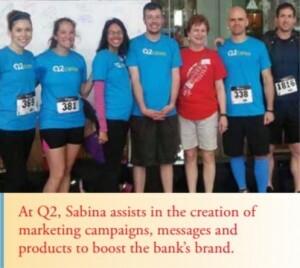 At Q2, Sabina assists in the creation of marketing campaigns, messages and products to boost the bank’s brand, lending credibility to their offerings and ability to compete against the larger financial institutions. Before she came to Q2, Sabina was an IT marketing specialist at a data storage startup in Dallas called Data Agility Group. Prior to that, she was part of the volunteer and events support team in charge of Partnership Walks and Golf Tournaments at the Aga Khan Foundation U.S.A. She has also worked as a social worker with The Care Communities, providing case management for individuals with cancer and HIV/AIDS. Good cuisine seems to be on the mind of our young professional, who is expecting her first baby in mid-September. “We are very thrilled,” said Sabina. Gender will be a surprise. A dedicated professional, Sabina tries hard to strike a good work-life balance. She attributes her success largely to her supportive family. The unwritten rule in her house is that the family has at least one meal together, which allows them to connect with one another. Sabina intends to get back to work within the first couple of months after the baby. “Technology allows me to work from home on days that there are family needs,” said Sabina. Sabina believes in giving back to the community and cochairs the Q2Cares Committee, which is the platform her company offers for employees to donate and volunteer. Besides that, she is also affiliated with Austin Citizens Police Academy Alumni Association, Women’s Community Center of Central Texas, Be the Change and the Early Childhood Development Center at Austin Ismaili Center.